Sow 62-3 farrowed 19 live piglets and one small dead one for a total of 20. This is the new record for our farm. It’s too many. 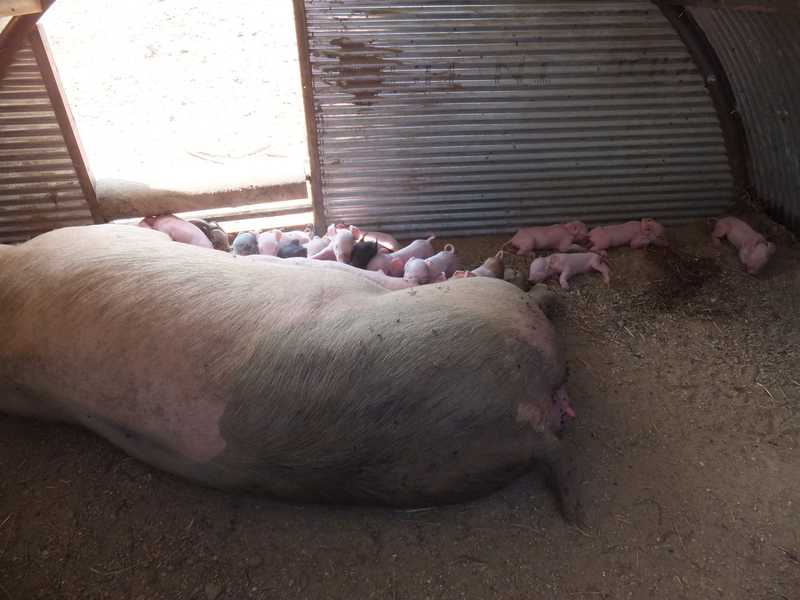 She only has 14 teats, and the piglets are smaller than I like. 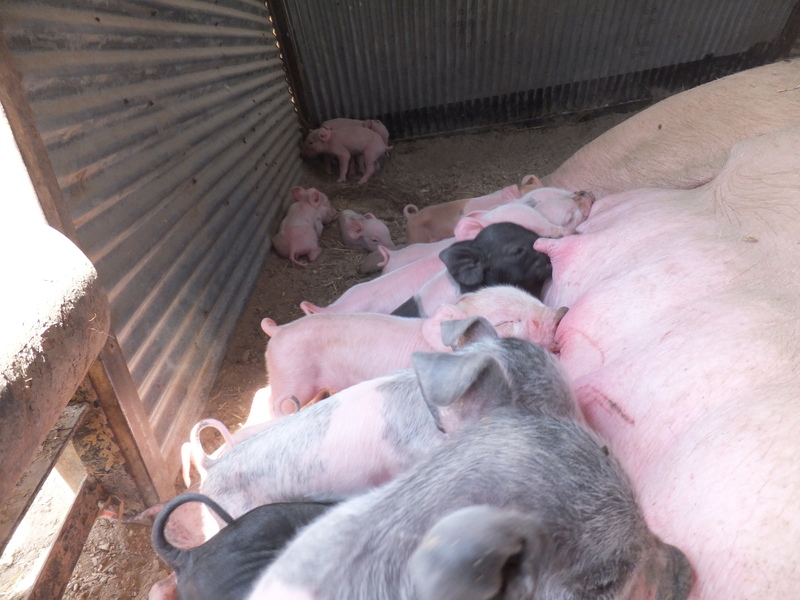 I won’t keep any of her offspring for breeding, as I would much rather have 10 to 12 larger piglets born per litter. But it’s still nice to note a record. I went to an informational meeting on how crops are being affected by the drought, and how we can use the stressed crops. The University of Wisconsin Agriculture agents lead the meeting. It was well attended with many interested farmers. The meeting was a little depressing, but my troubles were put into perspective as I drove home. When I drove to the meeting I noticed a line of people on the sidewalk near the Catholic Church. I wasn’t sure why they were lining up. When I drove home, the line was huge and leading to a semi trailer which read something like “Catholic Mission” on the side. The people were lined up to get food. This entry was posted on Saturday, July 21st, 2012 at 1:34 am and is filed under Curious hogs, Curious living, Curious weather. You can follow any responses to this entry through the RSS 2.0 feed. You can leave a response, or trackback from your own site. What do you do with the extra piglets? If another sow has farrowed within a few days, I’ll crossfoster extra piglets onto the other sow. It usually works well. Otherwise, the extra piglets will die as the sow doesn’t milk long enough at one time for there to be milk from a shared teat. We are all sad and sorry to hear abut these troubles. Difficult times now for so many people. It’s a way of keeping core body temperature low enough to keep from overheating so much..
Also – vasopressin is a hormone that helps with “thermoregulation.” In humans, it is arginine vasopressin but in pigs the arginine is replaced with lysine. No telling if it would help with the heat or not, but beans (of all kinds) are reasonably high in lysine. Any chance of feeding them some, or more, beans? Or something else that is high in lysine? At the very least, it might make an interesting comparison experiment; you could find out whether it might help. Thanks for all the cool links! The bottom link has an explanation for why pigs are one of the only mammals to build nests. Increasing lysine to prevent overheating is an interesting idea. Here is another link. This is the full version. If you are short on time, just read the abstract and later on, look over the full paper more carefully. I’m interested in these questions as they relate to humans. But in reading about “thermoregulation” over the years, I had seen quite a few references to the human vs. pig versions of vasopressin. The lysine may help a little, and of course, I hope it will. Apparently the important feature is the relative amount of lysine in comparison with arginine. In humans, lots and lots of “bodybuilder” websites show up — and they all make a point of saying that (again, in humans) more arginine than lysine, in supplements, is desirable. In pigs, the reverse. There is something else that may help more than lysine, with regard to overheating. Maybe more than one thing, but I’d have to ponder on it a bit. Pignuts. Are you familiar with these? The pignut hickory, Carya glabra, grows over a wide range. Is it possible to buy pignuts, and feed them to your pigs? Is it possible for the boys — and a handful of their friends, maybe — to gather pignuts from the woods? Pignuts have all sorts of nutrition . . . I have wondered about them with regard to human nutrition. They have more lysine than arginine, as an FYI.